Date Joined June 29, 2005 Location With Orochimaru in his bedroom, making sweet luv &lt;3 ALL THE TIME!!!! I get on it the most. BTW: OROCHIMARU;NARUTO;INU-YASHA; AND ASH ARE MINE!!!!! inu's thoughts after kikyo pinned him to the tree...his final thoughts. Inu & kagome have switched bodies thanks to kaede. Find out what happens in this twisted adventure. Please comment! this is a poem about kikyo. It took me forever to get it right and im really proud of it. if your a kikyo fan this is a must read! What if in the episode Kagome's Voice And Kikio's Kiss, Inu-Yasha DIDN'T wake up as Kikyo was dragging him down to hell? A Sesshomaru/Kagome fic, even though I really don't believe those two are a good couple. My first Balto fanfiction. When the white wolf that Balto had met that fateful night appears, what kind of tale does this wild wanderer have to tell? And what does the future have in store for him? Thrown into a strange new world, will a normal girl be able to find her way home with the help of those she meets along her journey? Original Story by Me, Draco. All characters are copyright to me. 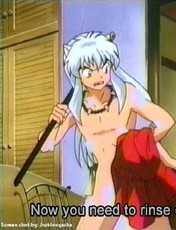 yay another inuyasha fan! wanna be friends? show your friends how much you care. Send this to everyone you consider a FRIEND, including the one who sent it to you. If it comes back to you, then you'll know you have a circle of friends. 0-2 peeps you are a Bad friend.Booo!!! 3-5 peeps you are an OK Friend! 4-6 peeps you are a Good Friend! 7-9 peeps you are a GREAT Friend! Yeah, it's been to long. So, wuz up?